We put across an assortment of pre school series books, which is really helpful for growing children. These provide useful guidance to children and parents regarding concerns like good habits, child safety and others. Our pre school series books have fascinating pictures in it, which attract the tiny tots. The minimum order quantity is 30 - 50 copies. 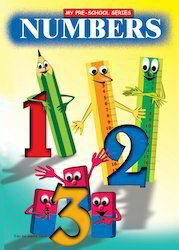 Numbers Book offered comprise pre-school series numbers learning books that involves teaching with picture books which makes learning a fun activity. This number picture book help children learn about number identification and counting as well as save them from boredom from just practicing on worksheets. We offer the book laminated on both sides with support of colorful & attractive pictures which catch the attention of the young learners. Apple Children’s Yearbook: A plethora of useful information encompassing science, history, space, sports, culture and momentous events of the year 2011. Free DVD included. Over 30,000 copies sold! Magnetic Minds: Educative and fun – an exceptional product from Apple Books (Patent pending). Watch children grasp ideas like a magnet! Magic Book: An interactive book with activities - A dash of magic, a sprinkling of fun and tons of interesting activities like colouring, join the dots, true or false, trivia etc. Flip the pages and watch the pictures appear and disappear! The Big Book of Facts: Become smarter and more appreciative of facts about our world. Looking for Pre School Series Books ?